Meditation has been used for centuries to reduce stress, increase energy, and enhance overall health and well-being—so it's no wonder more and more people in today's fast-paced and stress-centric world are adopting this age-old practice. 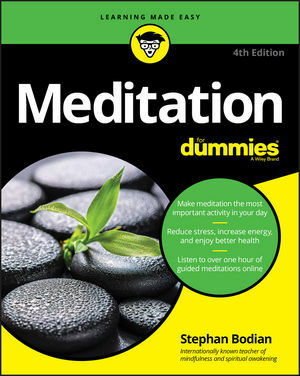 If you want to achieve a greater state of calmness, physical relaxation, and psychological balance, Meditation For Dummies is your life raft. Covering the latest research on the health benefits of meditation, this new edition explains in plain English how you can put meditation into practice today and start reaping the benefits of living a more mindful life. Whether you're new to meditation or a seasoned practitioner coming back for a refresher course, this plain-English guide provides a wealth of tips and techniques for sitting (or lying) down with your mind to meditate successfully. From preparing your body for meditation to focusing your awareness and being open to the present moment, it covers everything you need to put distractions to rest and open yourself up to a meditation practice that works for you. If you're ready to find some zen and benefit from all meditation has to offer, this friendly guide sets you up for success. Stephan Bodian is an internationally known author, psychotherapist, and teacher. He leads regular intensives and retreats and offers spiritual counseling and mentoring to people throughout the world. His bestselling app Mindfulness Meditation (with Mental Workout) has been praised in the New York Times and the Wall Street Journal.